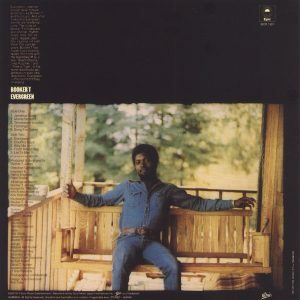 A surprisingly great album by Booker T – recorded after his Memphis years with The MGs, and his duets with Priscilla – and done in a sweetly mellow style that has Booker emerging as a whole new style of songwriter! As with all the post-MG albums, Booker sings lead vocals on all tracks – in a gently, almost folksy mode that fits beautifully with the compressed production of the set. There’s almost a Terry Callier-ish quality to a few of the cuts, and on others, Booker’s hitting a cool LA style that’s kind of a west coast take on the Memphis vibe – but with a few more rock-based touches. Playing organ and keyboards in the MG’s, one the greatest R&B and soul bands in the history of pop music, Booker T. Jones was no stranger to the pop world when he recorded Evergreen in 1974. As part of the MG’s, he played on innumerable Stax Records sessions backing everyone from Otis Redding to Sam & Dave, and the MG’s hit the charts a few times themselves, beginning with the timeless “Green Onions” instrumental in 1962. But things began going south for Stax in the early ’70s, and Jones could see the writing on the wall, leaving the label well before it filed for bankruptcy in 1975 and signing with A&M Records in 1971 and consequently releasing a series of albums with his then-wife Priscilla Coolidge. He signed with Epic Records in 1974, issued Evergreen, and then returned to A&M Records. 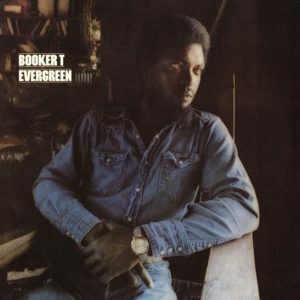 Evergreen isn’t a soul record, at least not the way the MG’s did it, and Jones wore several hats at the sessions, playing some guitar and bass on it in addition to organ and keyboards, handled most of the vocals, and also wrote, arranged, and produced all the tracks (with the exception of a cover of Kris Kristofferson’s “Why Me“). It’s really a laid-back roots album, and one doesn’t get any of Jones’ famous organ playing until the fourth cut, an instrumental called “Flamingo” and it’s there on the title track, “Evergreen“, as well, but most of the album is a light-breezed mix of folk melodies, subtle calypso, and reggae rhythms, ragtime, and what is know these days as soul-jazz, and it’s all very pleasing, but far from the greasy soul-funk sound of the MG’s. Wounded Bird Records reissued Evergreen in 2013, adding in six bonus tracks, which included the single version of “Evergreen” and interesting cover versions of “Take Me to the River” and “Whiter Shade of Pale” none of which change the overall mood and feel of the original album. Love Booker T. My fav organ player. Great one from a legend. Respect. Nice one from a legend, many thx. Never heard it before. But can’t forget Booker T & the M G ‘s! Beautiful music!!! Your site is really, really hot!!! What a great album. I had never heard of it before and it’s a shame cause this a great mix of Soul jazz/folk and more. What an excellent sound! Thank you so much for sharing a listen. This brotha had so much soul﻿. Thanks for introducing this gem to me. Greetings from Argentina. thx as always, Ive been gettin some really nice gems from you lately! Never seen it before. dig it. thans. Bravissimo. Bellissimi brani voce stupenda﻿. Unique and amazing LP all round. Good work Nikos.